Welcome to America's best post-frame building manufacturer. Your building project is one of the most important asset you have. So when you’re ready to build a commercial or agricultural building, get yourself the best Contractor in the Tri-state! (Southeastern MN, Western WI, Northeast IA). 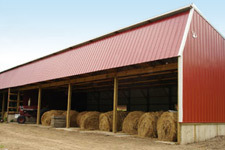 We’ve been in the agricultural and commercial building construction business for over 25 years. 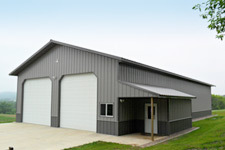 We specialize in Pre-engineered Lester Buildings. We use only the best materials & manufacturer to ensure our customers confidence. We are licensed and insured, and Lester Buildings offer the best warranty compared to other manufactures. Most importantly, we work hard to finish each project to provide our customers with an unrivaled level of confidence that there building will out perform all others. Postframe Buildings the Easier, Modern Way. More than 140,000 buildings since 1947. Renowned structures with a warranty to match. A uniquely flexible, modern and informed buying experience. Just a few reasons to consider a Lester. © 2010 Kevin Larsen Construction. All Rights Reserved | Servicing the Tri-State Area Southeastern Minnesota, Western Wisconsin, Northeast Iowa, USA. 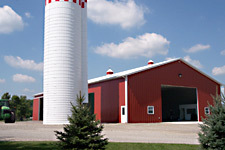 Coverall Buildings, Salt, Sand, & Fertilizer storage, Grain & Hay Storage, Beef & Cattle Buildings and more.